Wii Fit is perhaps the only form of physical exercise that many of us get these days, purely because – unlike going to the gym - it is fun and it is in our front room. 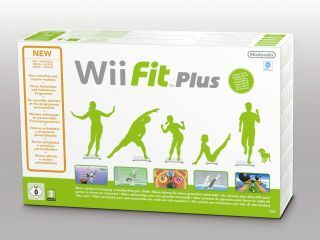 So this week's announcement that the new Wii Fit Plus UK release date is 30 October is a welcome one indeed, particularly if you are planning on getting in shape before the heavy-drinking and over-eating session that is the month of December! "For example, Lifestyle routine gives you exercise combinations to help train muscles and boost flexibility or even warm your hands and feet to ease tension," Nintendo informs us. "In Health routines you can work your tummy and fat burn, Youth routines help you train body and mind and work your lower body." The game also has a calorimeter to help you keep up with your daily progress which cleverly "estimates the amount of oxygen used by the body during physical activity and so estimates your calories burned on each activity during gameplay". Nintendo claims that a person with a 70kg body weight carrying out the games' Hula Hoop exercise for half an hour burns off the equivalent of 140kcal. Multiplayer options are also included, with the option for up to eight players to compete against one another in the balance and training games, or in running across the virtual floating platforms of the obstacle course, or in just having a lark by throwing snowballs at your mates or watching them flap their arms to land a hilarious chicken character as close to a series of targets as possible.